Back in December we brought you the order guide for the 2013 Ford Mustang, and now we can share the 2013 Shelby GT500 order guide with you as well. While it doesn’t include the pricing for any of the options that were released earlier this month, the order guide does provide a wealth of information including an overview of new features and options for the 2013 model year, a full list of standard equipment, and a list of optional equipment and corresponding order codes. You can see an overview of the new features of the 2013 Shelby GT500 below, and click the link to download a pdf file of the full order guide. 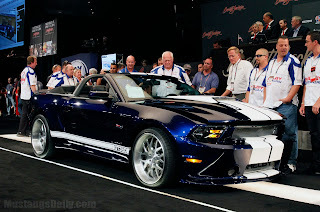 This entry was written by by MustangsDaily (Mustangs Daily) and posted here on Thursday, March 29th, 2012 at 10:30 am and is filed under 2013 shelby gt500, 2013 shelby gt500 order guide, GT500, News, shelby, shelby gt500. This article was not written by us, rather gathered using RSS feeds listed here. We take no credit for this article. You can leave a response, or trackback from your own site.